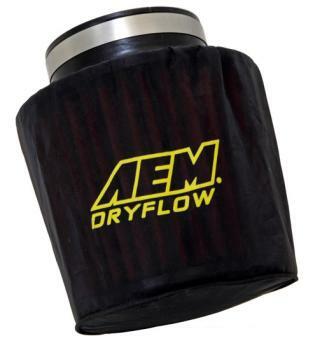 AEM has released six pre-filter wraps for AEM DryFlow Air Filters. AEM DryFlow Pre-Filters are manufactured from a durable micro-screen material and pretreated with a proprietary hydrophobic process designed to prevent splashes of water or mud from saturating your DryFlow air filter. These pre-filters are also perfect for use in harsh dusty environments. By filtering and keeping much of the dirt from the DryFilter air filter an AEM pre-filter wrap helps to extend the length of time between DryFlow air filter cleanings. They stop small dirt particles yet they add little restriction to the air flow of your filter. Each of these DryFlow Pre-filters comes with a yellow printed AEM logo. Each one is also made to fit a specific sized filter. There are more than 600 AEM air filters and air intakes that use one of these six Pre-Filters as an accessory.